Join a horde of rampaging Norse warriors on a quest for treasure in Vikings Go Berzerk, a 5 reel, 25 payline slot game from Yggdrasil Gaming. Available on desktop, tablet and mobile devices, this epic adventure comes with fantastic 3D visuals, instant win treasure chest bonuses and a free spins feature with sticky wilds and wild reels. Get pillaging from between 25p and £125 per spin. Vikings Go Berzerk is a terrific looking game - the reels are set within a longboat and include 4 lower value coins and a quartet of higher value Vikings. There's also a wild that replaces everything apart from the free spins, treasure chest and golden treasure chest symbols. Treasure Chests feature - when the treasure chest symbol lands on reel 4, it will reveal a special prize. This can be an instant win bonus of anything between 2 and 40 times your stake or 7, 14 or 21 free spins. Golden Treasure Chests feature - this symbol appears on reel 5 only and offers prizes of between 10 and 400 times your stake, 7, 14 or 21 free spins, a 25% rage boost to each Viking or the Ragnarök Free Spin feature (of which more shortly). Free Spin feature - as well as landing them via the treasure chests, you can also trigger 7, 14 or 21 free spins by landing 3, 4 or 5 scatters on the same spin. Before the feature begins, you'll pick for an extra modifier. On offer are Ragnarök Free Spin feature, 1-3 extra free spins, a starting wild, a starting wild reel, an extra 5 treasure chests added or an extra 5 golden treasure chests added. Any wilds that land during the feature are sticky and will remain locked in position for the duration. Whenever 1 of the Vikings land, it will do battle with a sea creature. If the Viking wins, it will turn into a wild. Vikings Rage feature - every time a Viking symbol forms part of a winning combo in the base game, it adds to that Viking's rage total. Once a meter is filled, you'll get a free spin with that Viking Berzerk. That means he's guaranteed to win his battle with the sea creature and turn wild. To help you on your way, one Viking's rage meter will already be at 50% the first time you start playing. Ragnarök Free Spin feature - in this feature, all the Vikings are Berzerk and guaranteed to turn wild. Trigger this feature from the golden treasure chest or the random picks before the triggered free spins start. There's plenty to get stuck into in Vikings Go Berzerk. The volatility isn't stratospheric though - in fact, the variance is in the medium range, offering a balance of payouts in both the base game and free spins features. Yggdrasil Gaming are renowned for their terrifically well-designed slots games and Vikings Go Berzerk will add to that glowing reputation. It looks terrific and the range of features is impressive too. 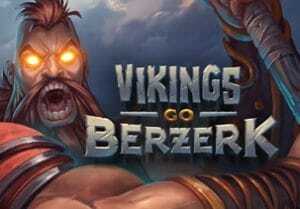 Put all that together and Vikings Go Berzerk is an entertaining and highly playable game. I also recommend you take a look at its prequel, Vikings Go Wild.